It can be tough to stare down your disorganized garage. It’s been years since you’ve seen the back wall, and all of your belongings continue to pile up. You’ve considered organizing it, but that would mean dragging everything out into the driveway, revealing to the entire neighborhood that you’re a few items away from being a hoarder. Not only would it be a personal reckoning, but it would also be a social gauntlet. Fortunately, Garage Solutions offers a way for you to declutter your garage. Our storage and organization services, including cabinets and walls systems allow you to get your stuff off the floor and out of the way. First, we have to address the five most common excuses for not tackling the messiest room in your home. This is a great first step. The step after this is to either ask for help, or find an answer to the question: “where do I start?” In most cases, you can start with keeping 25 percent of your belongings and throwing out the rest. This seems like a low number, but it will force you to really assess what you need and what you think you need. Furthermore, numerous studies surrounding procrastination, which is most likely what you’re facing with this excuse, show that simply starting, no matter how small the step is, results in the best possible outcome. Prioritize. How important is that next episode of your favorite show? What type of activity are you committed to outside of work, family, and obligations that you can sacrifice for a Saturday or Sunday morning to get started on your garage organization? Let’s be real. 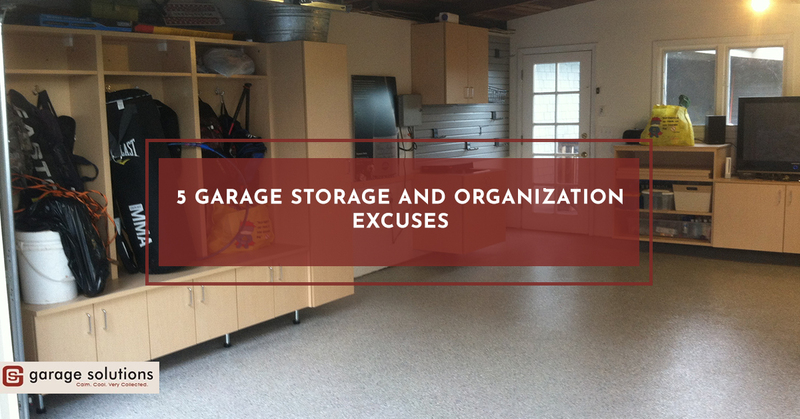 Most people like you have time, but you simply won’t prioritize garage storage and organization. Now, if you genuinely don’t have time, have you considered a home garage storage solution? Garage Solutions has been serving San Francisco for years, and we offer custom wall and cabinet storage systems to fit your needs. You’re probably too close to your garage to know the difference between organized and disorganized. Have you compared your garage to your neighbors’ garages lately? How much clutter do you have? Are you aware that an organized garage saves you time and money? Reconsider how much of a headache it is to climb between and over boxes to get to your child’s sports equipment from the “back” of the garage. When you choose to organize your home garage, you will find peace, relaxation, and pride each and every time you enter or exit it. Everything is in its place. Research. You can go online and type in “Garage Solutions San Francisco,” or you can ask your friends. Either way, you’re collecting information on which garage solution system to choose. Furthermore, when you choose Garage Solutions, we offer comprehensive, turn-key garage storage and organization services in and around the San Francisco area. No longer do you have to design, purchase material, install, and organize your garage alone. We’re here to help! Have you created a budget and then priced out what it would cost to install a garage storage solution? If the answer is no, it’s time to reconsider the project. What if you could call one company, get a quote, get a design, have your storage system installed, and your garage organized? Would you do it? Most of the time the answer is a resounding yes. Garage Solutions is proud in the way we work. Our design process is unique to the industry and custom for the customer. Our customer service and delivery of assets is beyond reproach. We do our own installations as certified, qualified technicians. Finally, our number one priority is quality of workmanship paired with high-quality materials. When you choose us, you get only the best. Need a home garage system to organize your belongings? Call us today!